Baseball fans of a certain age, of which I’m closer to being than I want to admit, harbor the notion that there once was a time when players didn’t change teams as often as they do now. While that is technically true, the change is not as marked as many of those fans would have you believe. The fact is that it was only the steady regulars, stars and superstars who rarely changed teams — that is, until the end of their careers when the clubs for which they played most of (if not all of) their careers decided they no longer had use for them. It’s the reason that Babe Ruth ended his career with the Boston Braves and that Warren Spahn split his last season between the New York Mets and San Francisco Giants. No team in baseball is immune from employing the over-the-hill star looking to hang on to his career as long as possible. The Phillies very recently proved this once again — I think I will have to do a double-take for the rest of my life every time I see one of Pedro Martinez’s Phillies cards. However, even within this arena, there are still players who you might not know ended their career with the Phillies. 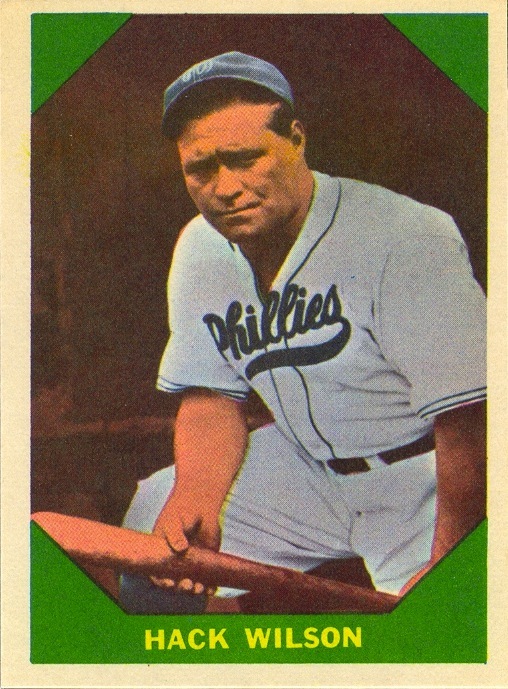 The one that surprised me most when I first encountered it was Hall of Famer Hack Wilson ending his career in Philly, and I never would have known it if I hadn’t stumbled across his Ted Turner-ized 1960 Fleer, #48. 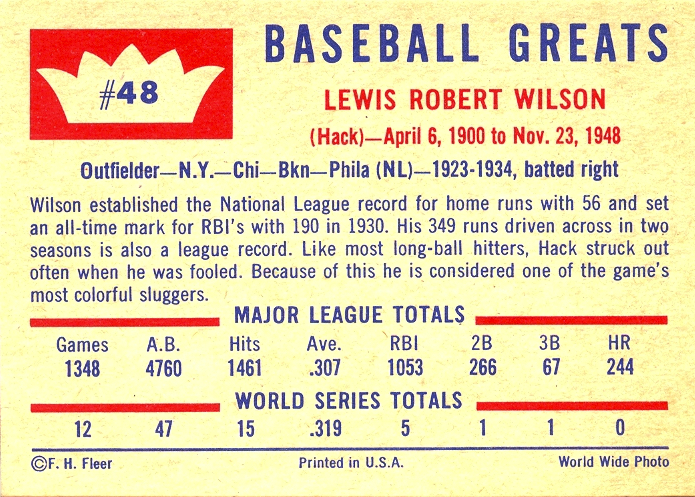 Now, Hack Wilson is one of the many egregious Veteran’s Committee selections from the 1970s. In the past 30 years, the standards for induction have increased greatly, and if hadn’t been elected at that time to the Hall of Fame along with many other notable, but otherwise not spectacular players from the 1930s, then he would probably remembered only for holding the record for most RBIs in a season (191). Hell, it’s possible that many people only know who he is because of that. Whatever people remember him for, his career-ending stint with the Phillies is almost certainly not recalled. His unimpressive line in his seven games with the Fightins: .100/.217/.100. Okay, there is the small sample size issue — only 23 plate appearances — but that’s ugly no matter how you look at all. What surprises me most, however, is the fact that he even has a Phillies card. He was only with the team for seven games before calling it a career, so the fact that there was even one picture of him wearing a Phillies uniform is utterly surprising. The fact that Fleer chose that picture over many others of him in a Cubs uniform, the team everyone associates him with, would be like Topps deciding today to issue a card of Mike Piazza wearing a Marlins uniform as a legends variation. It just doesn’t make sense. There are plenty of other players who don’t look right wearing a Phillies uniform, despite the photographic evidence that they did. But of all them, Hack Wilson will for me stand out as the absolute oddest.